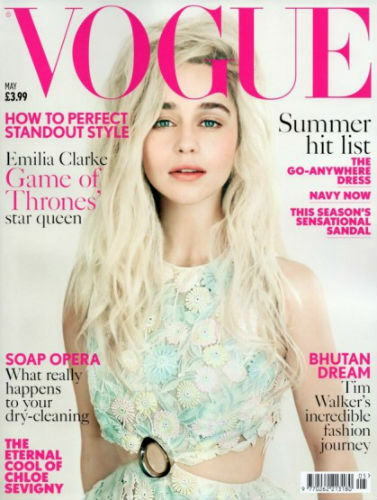 -Game of Thrones star Emilia Clarke deserves a way better cover than what Vogue UK just saddled her with. -Meanwhile, her costar Kit Harington plans to “be a good little hunk and shut up.” Good boy. -This is incredibly sweet: Blake Lively made all three of her Sisterhood of the Travelling Pants castmates godmothers to baby James. –Jay Z shared footage from his wedding to Beyonce in honor of their 7th anniversary. -I ended up working stupid late last night and had the TV on in the background, which meant I caught all of Madonna‘s appearance on Fallon. What I learned: she lives in fear of her kids calling her “basic,” she once accidentally asked her 13-year-old son Rocco if he had any friends she could date, she’s super terrible at standup comedy, and her toy instrument rendition of “Holiday” is wonderful. -Also, Fallon taught Nikolaj Coster-Waldau a dance designed to embarrass his kids. –Kanye West covers the new issue of T magazine, where he informs us that we’re all living in A.Y. — After Yeezy. Okaaaaaaay. -I love that every entertainment site I visit seems to be hate-recapping CSI: Cyber. –Karl Lagerfeld turned down a part in Zoolander 2 because he thought it was a “silly” stunt. –Alyssa Milano’s breast milk was confiscated at Heathrow Airport and she’s not happy about it. -Listening to Sandra Bullock’s 911 call about a stalker in her house makes me want to install a panic room. –Gwyneth Paltrow is going to live on food stamps for one week. Artisanal, farm-to-table food stamps. -Ruh roh. As a frat boy, Jon Hamm allegedly used the claw of a hammer to drag a pledge around by the balls. -This is probably the most realistic summary of TV shows’ renewal chances I’ve seen yet. -Congrats to Isla Fisher and Sacha Baron Cohen, who just welcomed their third kid. –Harvey Weinstein will not face criminal charges for allegedly groping a model because Hollywood. -Need one last soul-crushing experience before this week is over? Here’s a new Entourage movie trailer. -Disney dropped a new featurette for Tomorrowland. Sigh. I wish George Clooney could narrate my life.